These were one of the things I bought recently from IFIT and babyEbi is really enjoying working with them. 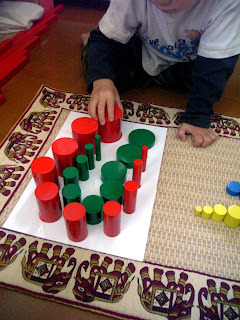 followed by three colours, this one is quite tricky and even more so if you have hiccups at the time! 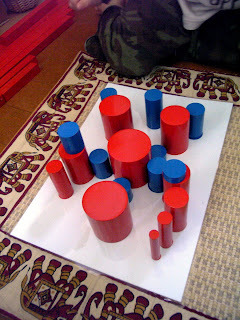 Then I made some which need cylinders placing on top of other cylinders, babyEbi hadn't really got the hang of this one yet. 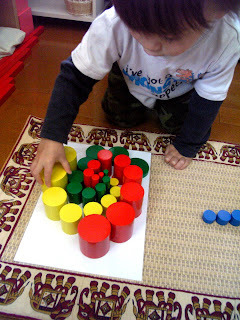 Once the child can create the patterns of top of the paper they can re-create the patterns next to the paper, this is quite hard, especially for a little boy who isn't yet three. 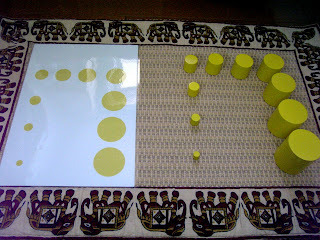 If you would like a set of these patterns then pop over to my lulu store the colour tablets file is also there. 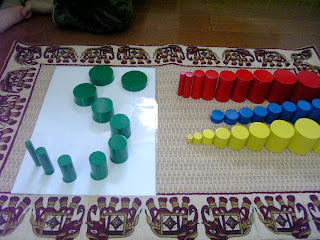 I am also interested in hearing about any other extensions that can be done with the knobless cylinders. Very nice! 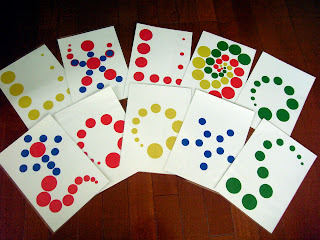 This post makes me want to buy the knobless cylinders :) I'm still working on my color tablets. 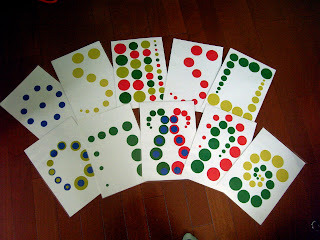 After I finish blogging, I'm going to laminate them, so that we can start working with them tomorrow. I'll post about them once I finish them. Thanks so much for such great tablets! These look like so much fun. Nicely done.